. 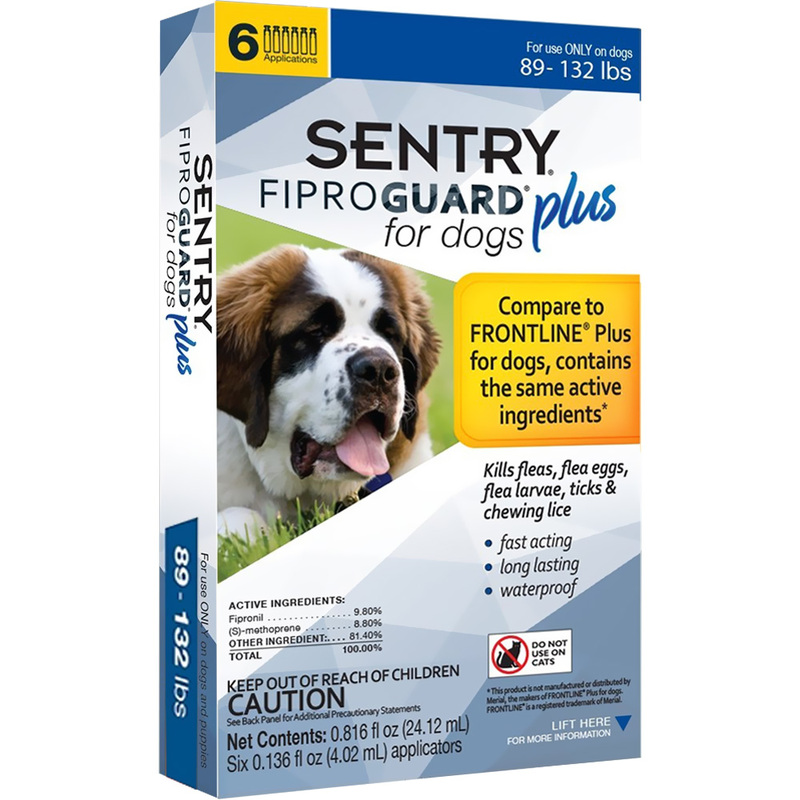 . . contains the same active ingredients found in the popular top seller, FRONTLINE Plus! 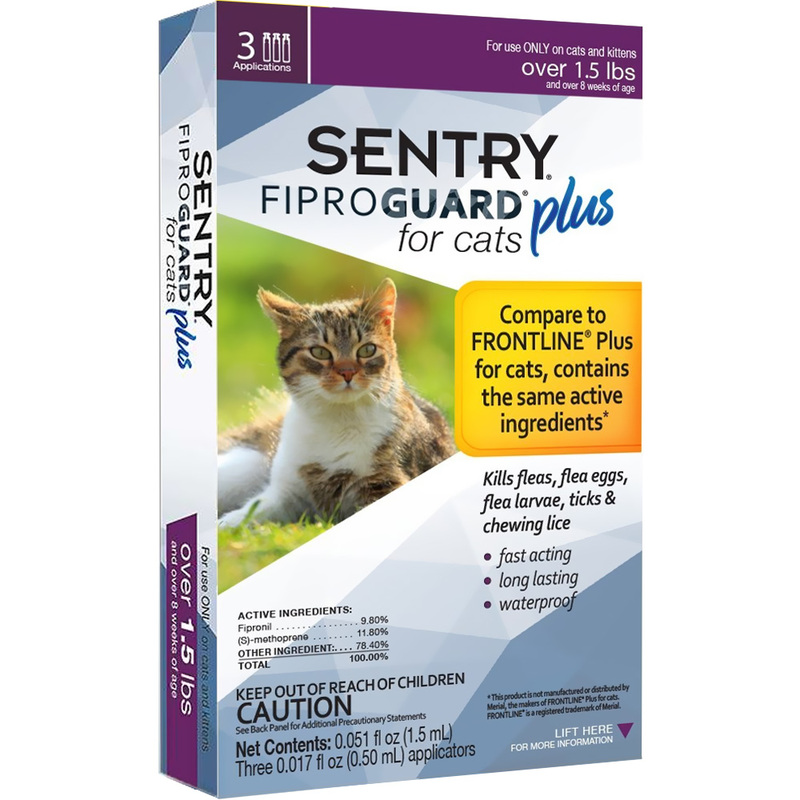 This monthly topical treatment utilizes Fipronil and (s)-methoprene, the ultimate pair of ingredients for flea and tick medications. By working together, they’ll keep your pet pest-free for up to a month with a single application! While fipronil kills the adult pests, s-methoprene is a synthetic hormone that works as an insect growth regulator to prevent the young eggs and larvae from growing until they eventually meet their demise. Fiproguard Plus doesn’t forget about chewing lice either. While working to eliminate fleas and ticks, this medication also kills chewing lice that keep your pet itching for days on end. 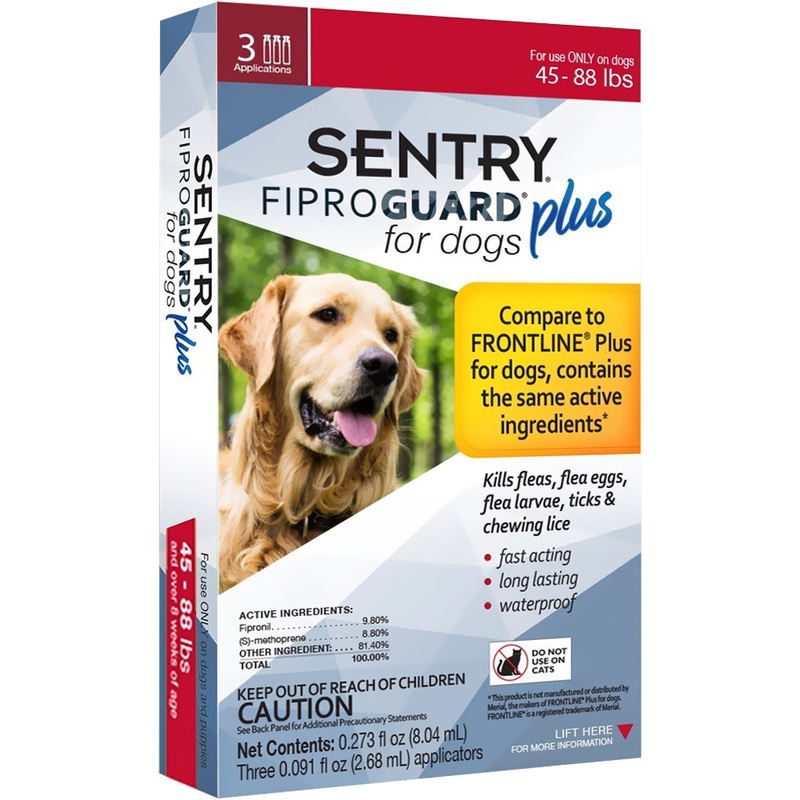 Whether you have a small Pomeranian or a heavy Golden Retriever or an itching kitty, SENTRY has formulated Fiproguard Plus for dogs of all sizes and felines too! 6 Pack of this item have been discontinued. As with medications for humans, carefully read and follow all label instructions thoroughly before purchase and application. Don’t guess! 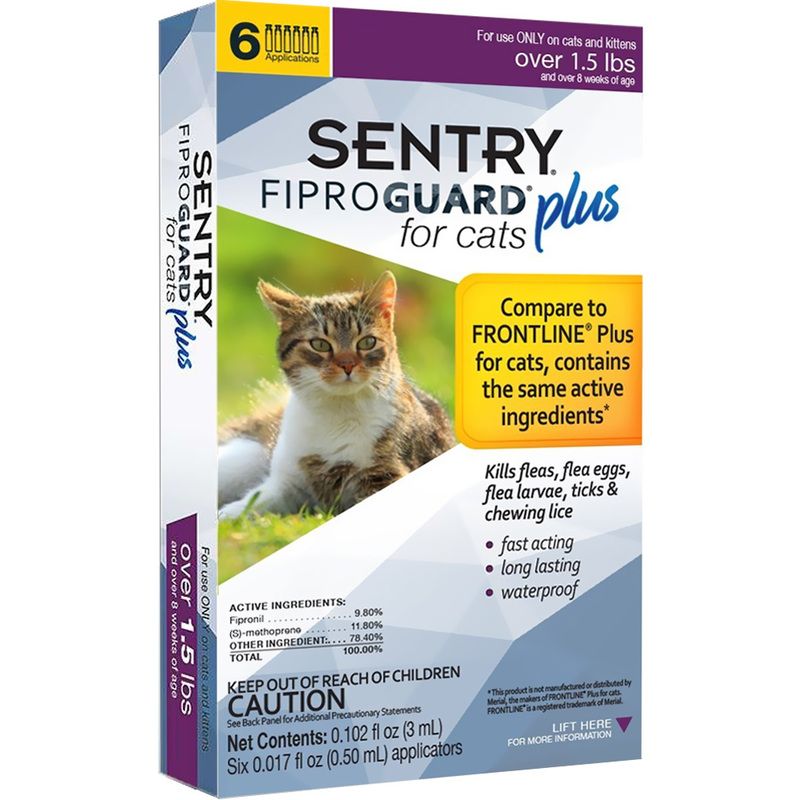 Be sure to weigh your pet to ensure that your animal’s weight matches the dosage listed on the product package. Never use a flea and tick treatment and prevention product intended for dogs on a cat and vice versa. Our squeeze-on products are designed to work alone and NOT in combination with other flea and tick control products. Check the product label of the flea and tick treatment used prior to ensure the recommended time has passed since the last application of any product before applying a new product. Separating pets ensures that the flea and tick treatment doesn’t rub off or pets lick the product off each other. As with any flea and tick treatment and prevention squeeze-on, even the smallest amount of product that gets into a dog’s or cat’s mouth can cause drooling or foaming — and in rare cases can result in death. For example, do not use half a dose made for a 40-lb. dog on a 20-lb. dog. Also, do not combine two tubes of a lower weight break for a larger dog. Always use the full tube on the pet per the product’s application guidelines. My dog is on heartworm medication. Will these products react to it? We suggest that you check with your veterinarian, most flea and tick products are ok to use with heartworm only medications. 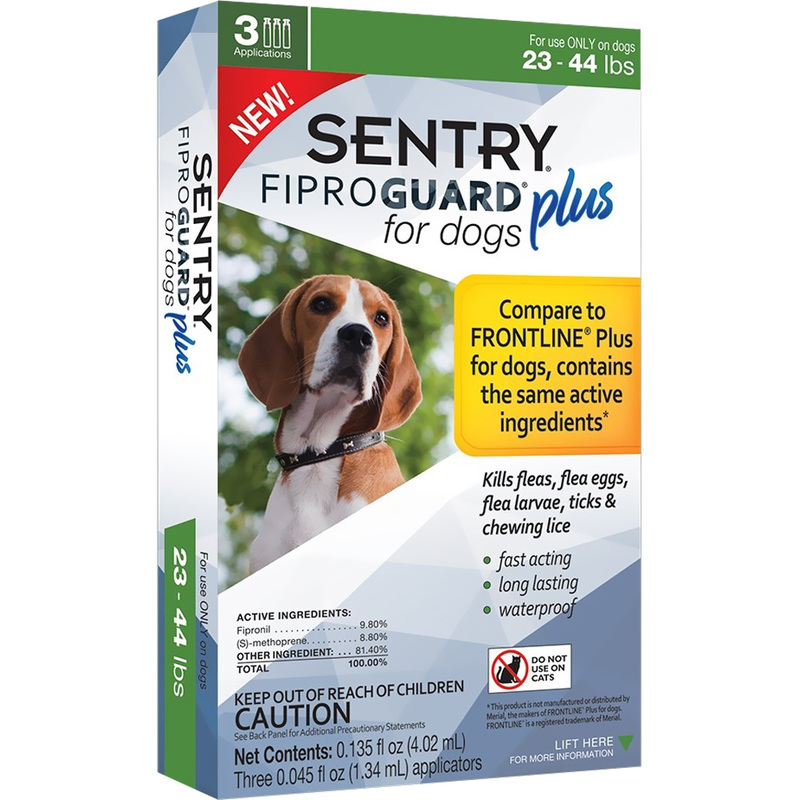 How does SENTRY Fiproguard Plus spread over a pet’s body? How long will it take for the product to begin to work? 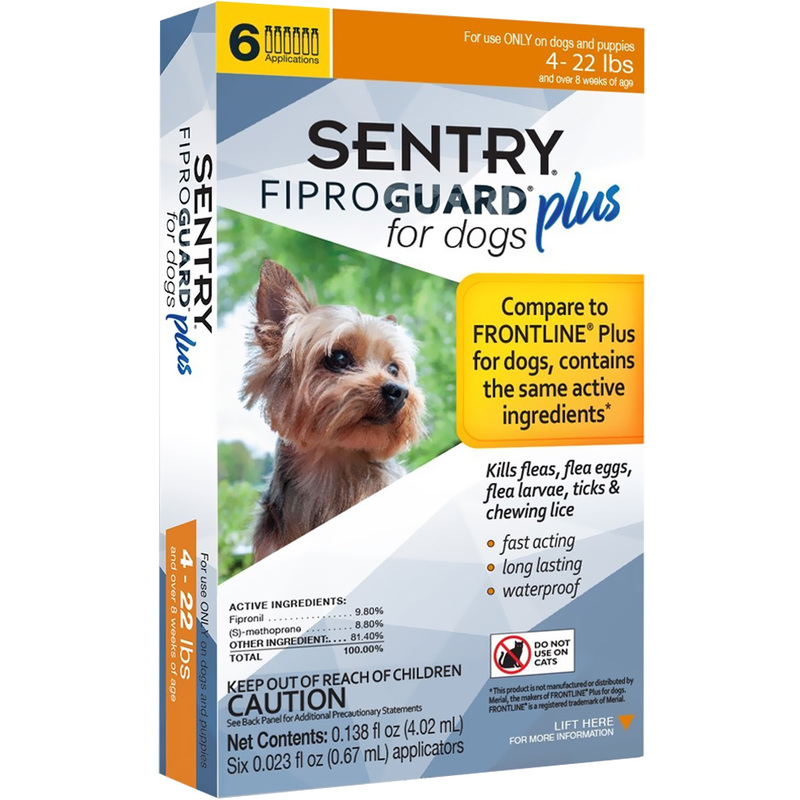 The product should begin to kill fleas within about 12 hours of contact with your pet. It may take closer to 48 hours to begin to kill ticks. What types of ticks will the product kill? This product will kill brown dog ticks, American dog ticks and lone star ticks, and deer ticks, which can transmit Lyme disease. 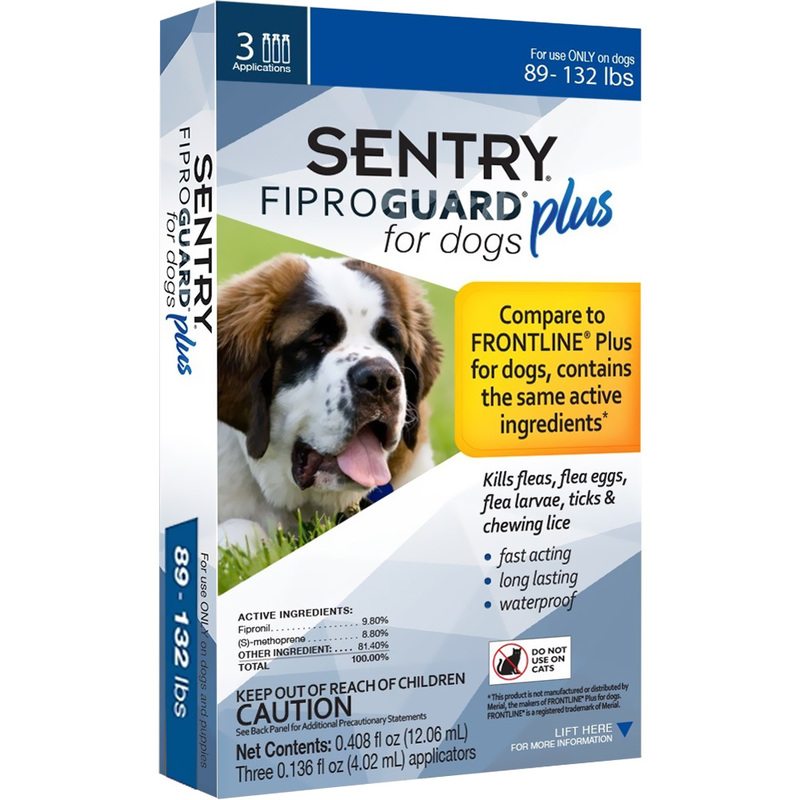 Can I pet my dog or cat after I have applied the product? Yes. 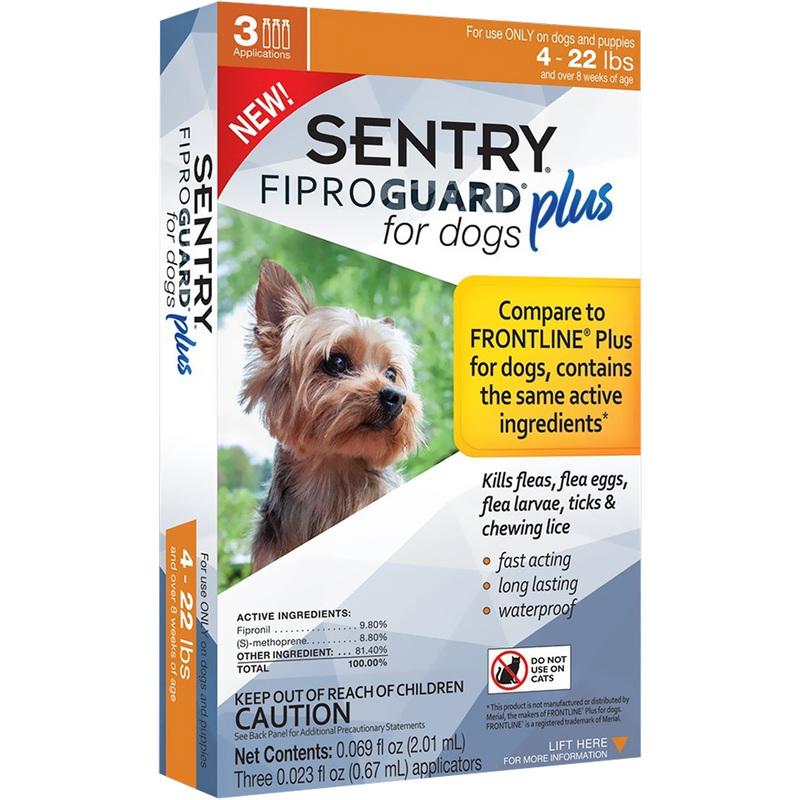 You are safe to pet and play with your pet after the product has been applied. It will take about 24 hours for the product to spread and dry on your pet, so if you handle and/or play. Ultricies neque sollicitudin sit amet phasellus vel est quam vivamus finibus. 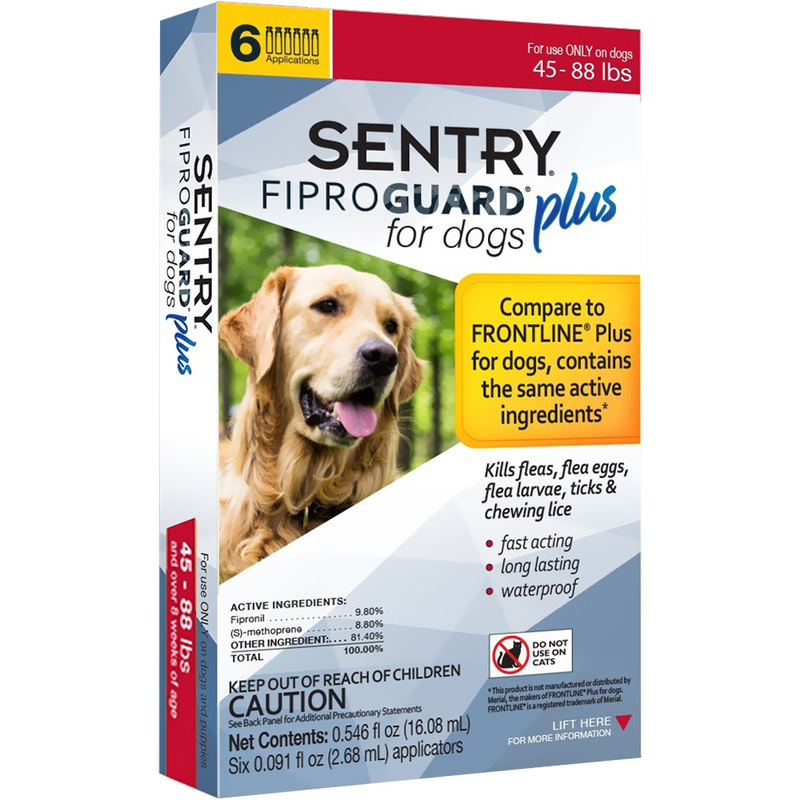 Copyright © 2018 - SENTRY® Fiproguard® Plus - FRONTLINE® is a registered trademark of Merial.